I know you are all in a panic, as I am, now that December has arrived. There is one fun thing about the date and that is linking up with Lynne's Fresh Sewing Day. There was some secret sewing, in fact, there was a lot of secret sewing, so I might have shown a sneaky photo or two in this mosaic. I spent the month sewing for bees, making pillows, clutch purses and making quilt tops. I have never had 4 quilt tops waiting to be quilted and they will all have to wait until after Christmas except the Hurricane Sandy quilt. 1. Coasters for my friend, Maureen. I need to make 3 more sets for other friends. These are super easy, just a panel from Spoonflower, cut up and sandwiched with batting and a backing. 2. 3 Clutch purses, made as samples for the class I am teaching at Sew South in March. 3. 2 of Jeni's Giant Star quilts made with Indie fabrics. 4. 2 Bee blocks for Cindy in the Modern Stitching Bee. 5. 6 Blocks for Hurricane Sandy Help. 6. Travellin' Pic Stitch EPP pillow. 7. Hadley's strip for Stitch Tease Bee. 8. Made the curved Piecing project from Sewing Summit into a pillow. 9. iPad case with handles. 10. a third quilt top made with Indie. 11. Hurricane Sandy quilt top made with blocks sent from others. What another fabulous month of makes from you. Now let's all panic about Christmas! Wow! 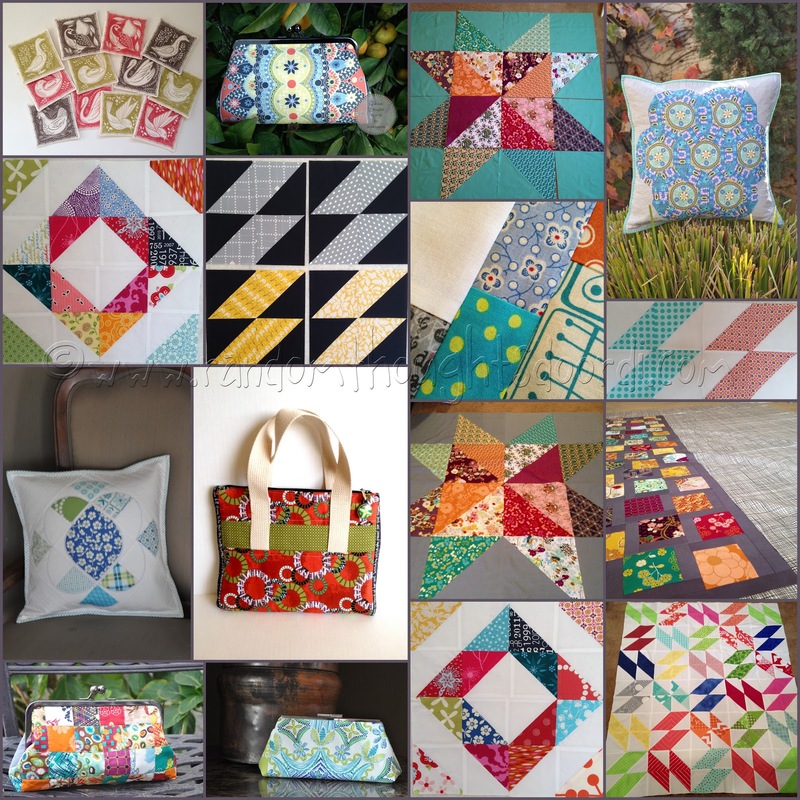 You had a very good month of quilting with so many beautiful projects. Great job~! Wow, you have done heaps! Another triumphant month! Lots of lovely things to look at and to be proud of! I'm not panicking, I'm in denial, blissful denial ;o) Still, you had a great month! Those are all so beautiful, such a lovely month. What a lovely bunch of work! Phew! Go take a rest. Oh no, you can't until after Christmas! Hi Di, not as much as you! I've been reading your blog for a long time and have just worked out how to comment. Love your sewing and hearing all about your family. I would love to sew more often but with 3 kids aged 3-9 and working 4 days a week don't get enough time. Looking forward to our 6 week summer break coming up on dec 14th here in Australia. wow, lots of gorgeous finishes, you've been busy!!!! Im always amazed at how much you accomplish each month. Amazing! Eveything looks great.